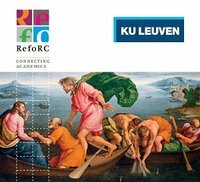 The Fifth Reformation Research Consortium (RefoRC) Conference will be held May 7-9, 2015 and will hosted by the KU Leuven in Leuven (BE). This edition of the annual conference will explore transregional dimensions of the Catholic and Protestant Reformations in the early modern period. The theme of the plenary papers is Crossing Borders : Transregional Reformations. The conference is open to individual short paper presentations (20 minutes presentation, 10 minutes discussion) and to thematic sessions of two or three short papers. It is also possible to attend the conference without presenting a paper. While we encourage papers on the conference theme, papers can focus on all disciplines related to the 16th century reformations, such as arts, philosophy, law, history, theology etc., independent of the theme of the plenary papers. Short paper proposals and registrations can be submitted online via the registration form. Short paper proposals are welcome before February 15, 2015. The registration will be closed on May 6, 2015. Your registration will become effective on receipt of your payment. More information can be found on the conference website.